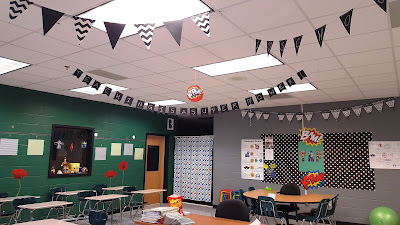 After 18 years of teaching, I still love organizing and decorating my room at the beginning of each school year. I just finished setting it up, and wanted to share some ideas with new teachers that I either found on Pinterest (greatest teacher resource of all time) or developed on my own. Enjoy. Welcome to my classroom. As you can see above, the walls are mostly bare. I like to decorate the walls with student work. When I first started teaching, I spent a great deal of money on motivational posters and felt I had to fill every inch of wall space, none of which meant anything to my students. As a matter of fact, this article hints that too much on the walls can be distracting to students. 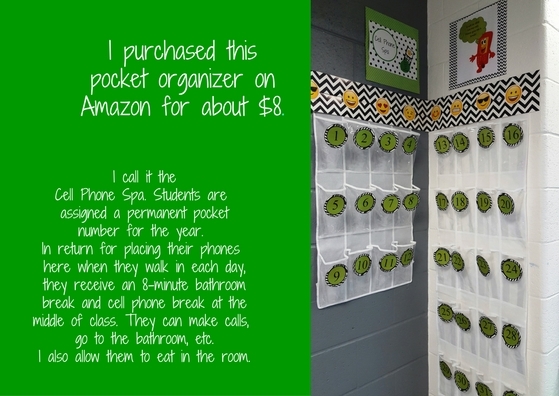 Instead of calling it "Phone Prison," I called it "Cell Phone Spa" because the term "prison" sounds so severe and hits a little too close to home for some students, while "spa" sounds more positive and safe. I did not simply demand they put their phones in the cell phone spa. 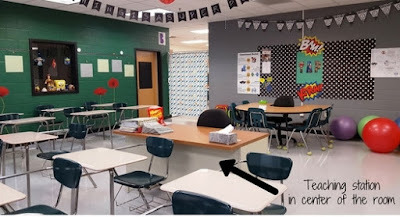 I discussed the research on how distracting phones are in class, I promised never to touch their cell phones, I presented severe consequences if they touched someone else's cell phone, and I located "the spa" in the front of the room so they could see their phones at all times. In addition, I gave them privileges in return . . . allowed them to eat in class, allowed a short cell phone break in the middle of class to check texts, and allowed them to go to bathroom as needed. Some students thanked me at the end of the semester for banning cell phones because they knew their grades suffered when they were allowed to keep them. 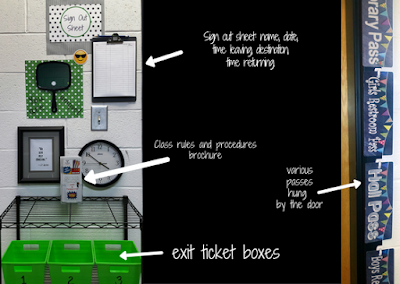 Placed near the door are a sign-out sheet and various hall passes. I allow students to go to the bathroom without permission, but they must ask permission to leave the room for other reasons. They write their names, time leaving and destination on the sign-out sheet and then write the time they return. We discuss several times during the first month of school how important it is to go straight to the bathroom and back in order to continue enjoying this privilege. Also by the door, I have placed green boxes for exit tickets which I use regularly as a summarizing strategy/formative assessment tool. After they complete the exit ticket at the end of class, they drop it in the box on the way out. I collect them at the end of the day and analyze what they learned and what needs to be reviewed. I am a big believer in transparency in the classroom, so I display the entire curriculum on the bulletin board. 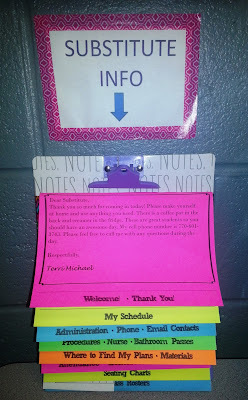 Each unit folder displays the unit map, key terms, assignments, and standards. Inside each folder is a list of unit key terms students can grab. 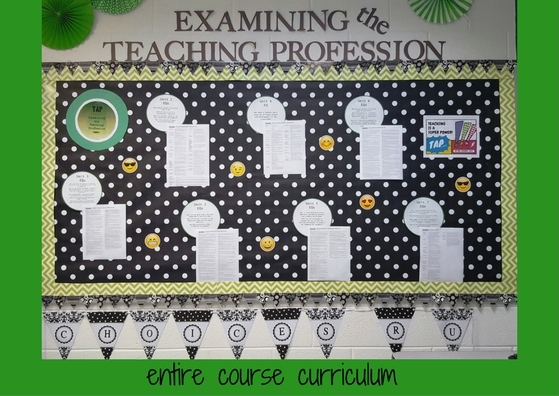 I also display the syllabus, class policies and procedures, course map, and movie list. Of course, all of this is available online at the class website, too. This is where I plan lessons, take attendance, and collect/grade/redistribute papers. My credentials are displayed here as well. I LOVE this sub information flip book and so do my subs. 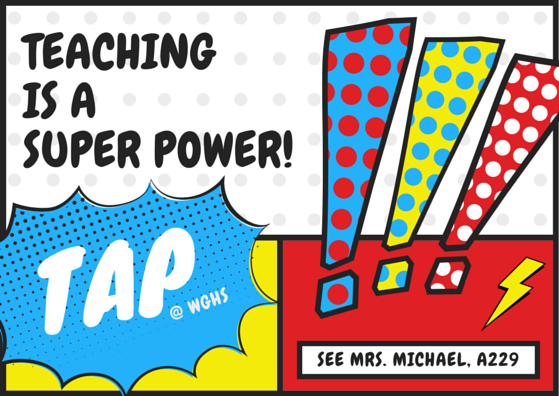 You can find this at Teachers Pay Teachers. I decided at the end of last year not to lecture anymore in class, and this article I recently read validated this decision. 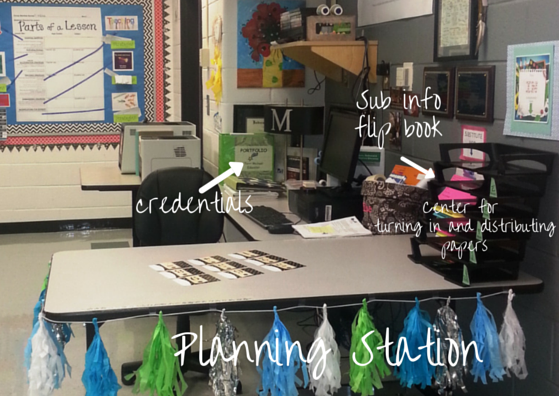 Instead, I have set up various learning activities and assignments for students to complete independently or in groups. I plan to use this center station when addressing the whole class, monitoring working students, and proctoring tests. I want the majority of my teaching to be "with" or "among" the students, not simply "in front of" them. I quit decorating the walls about five years ago and now fill them with student work. 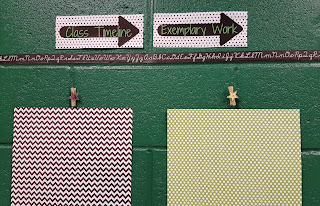 I created a classroom timeline display based on this idea from Pinterest in which I display exemplary work on the sheets along the timeline. 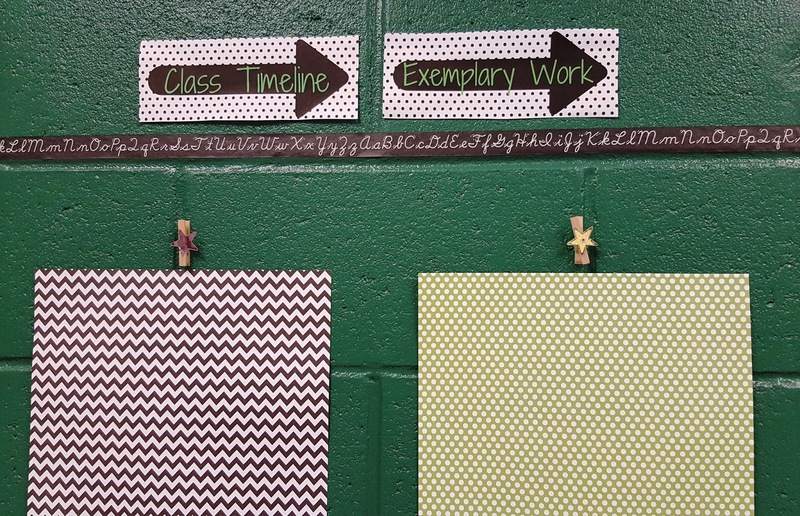 Other student work goes above and below the timeline display sheets. The students love to see their work on the walls. Yes, even high school students. I also like to take photos throughout the year and post along the timeline. Because I teach an elective CTAE pathway, Teaching as a Profession, I must recruit students to my program. This year I have developed a logo for the program and will use it on all correspondence, teaching handouts, and promotional materials. It might be a fun idea for any classroom. 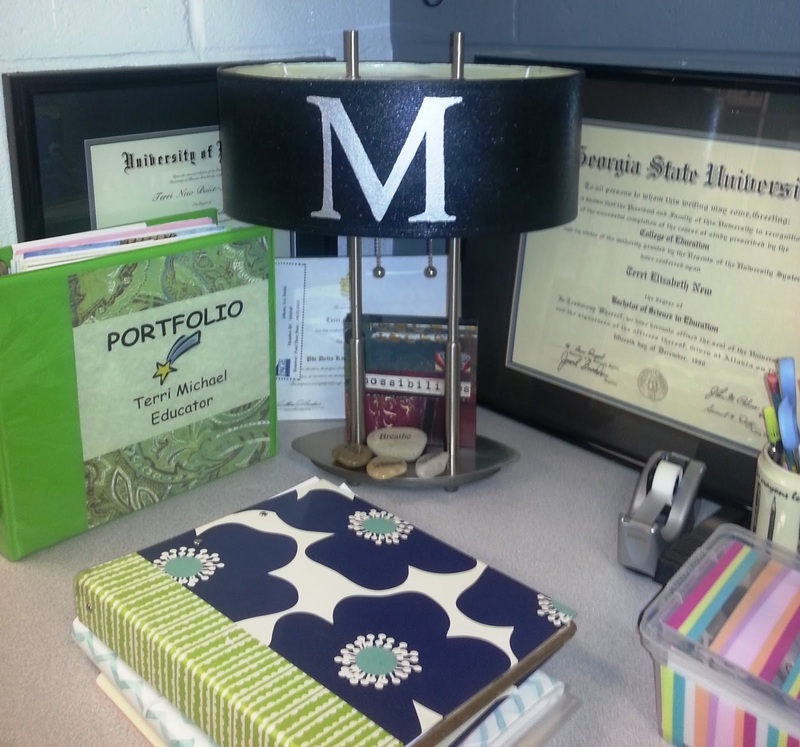 Students could even create the logo for your class. May you have a wonderful school year. What were your consequences for touching other students' phones? I am a new high school teacher, and I have been wanting to implement this in my classroom, but can't think of a way around the "someone took my cellphone" when it happens. Thank you! It was an immediate referral to an administrator, which was my highest consequence. No warnings. I am fortunate enough to be in a school where admins support teachers strongly. I have also been fortunate in that the last two years I have implemented this policy, not one time has a student messed with another student's phone. Of course, at the beginning of the year, we have heartfelt discussions about the class policies and why they benefit all students. One suggestion if your admins prefer teachers deal with their own discipline problems is the student who touches another student's phone without permission loses their right to use their phone at all in the classroom. Maybe start with a month's ban. Also, make sure the cell phone storage is open and easy to see in the classroom. That reassures students. I hope this helps. Thank you so much for reading this. Good luck. Thank you so much for your advice! I just always think a student is more likely to take someone else's phone when it's time to pick the phones up at the end of class. Not that it would be crazy all the time, but if everyone is trying to get their phones at the same time, and no one sees who takes a phone thats not theirs. My ultimate concern is having an upset parent because we could never find the phone. I solve this by letting them get their phone about 5 minutes before class ends) I call them one by one and stagger them about 10 seconds in between. I am a CTE teacher as well-agriculture science and I am also a first year teacher this year. I loved all your tips and plan to use a lot of them this year! Thank you so much for your blog post!! The problem with the cell phone idea is that at my school if the cell disappears in that situation the teachers are responsible and would have to replace it. Mine, too. I do take a chance. Some teachers put them in tubs and lock in a closet during class. I am fortunate that I teach the "Teaching as a Profession" classes, and these future teachers are pretty trustworthy. 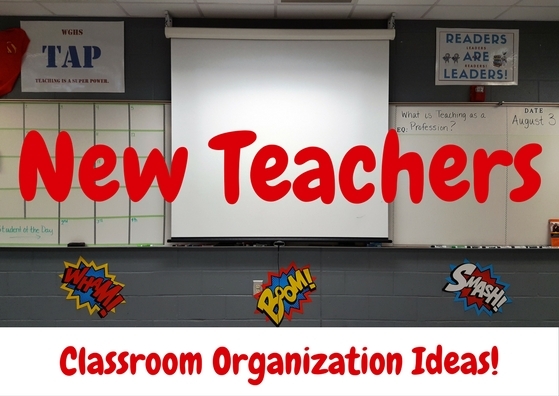 I am starting student teaching this fall for both 9th and 11th grade history students. I am nervous about so many things (especially the phones), but your blog is so helpful! I'll discuss the phone idea with my cooperating teacher :) Do you have any suggestions for leaving work/plans when I'm sick/out for the day? We don't have subs, the cooperating teacher will probably take over the classroom. Thanks! It's almost here . . .
Big kids need brain breaks, too.